I recently became the owner of a new VR3 Dive Computer from Delta P. Mine was unlocked for Trimix Open Circuit Diving and was supposed to be able to get me out of the water much faster than my Dive Rite Nitek HE. I have loved my HE ever since I got it in 2004. It has been with me on many dives both deep and shallow. I have made use of its programmable 7 gas capabilities using as many as 5 different gases on a few dives over the years. To me my HE was everything I really needed – until I started diving with the likes of Tom Mount. The guys in the water on an HE were left hanging for Deco with me on the line while the guys sporting a VR3 were hopping out of the water up to 20 minutes sooner than the rest of us. I still resisted change for a while. $1,500 for a VR3 was simply more than I was willing to give to get out of the water 20 minutes sooner. Besides, I saw those guys programming their VR3’s at the start of each dive. I would press a few buttons and be good to dive on my HE. That VR3 seemed to take hours to get prepped for a dive. In reality I would set my HE in about 2 minutes and the VR3 guys spent about 20 minutes pre-dive. This could be attributed to them being students now that I look back on those days. So I finally got a VR3. It was an offer I couldn’t refuse. I got a monochrome display Open Circuit Trimix VR3. I’ve enjoyed it so much that I’m actually thinking I might go ahead and get the Color VR3 shipped over from Delta P. Hell, I might even spring for the games add on for my next VR3. Sometimes it’s nice to be an Examiner with companies who want to put their gear on you. This week I’ve been out on a boat with a few friends doing some deep wreck dives. Dave, David, Richie and Carrie along with me and seven other divers and six crew as well. I’m writing these blogs as we go – as we all are for our individual websites and Hollywood responsibilities. You get to read them when I get back to land and reality and Wifi and voicemail. David read the manual before he left Fort Lauderdale to come out and meet the boat. I had a manual but in true IT fashion I just couldn’t manage to read the dry text nor retain what little I had managed to muddle through. David is a computer software engineer and I’m a vagrant dive bum. I don’t like instruction manuals. I’ve always found that dive computers are a learn on the fly type of equipment because it’s really hard to visualize what the screen “will” look like when you’re on a dive and looking at a screen at 300 FSW (feet sea water). So day one on the boat – we wake up early and sit on the bow as the boat motors up to the wreck. We will be diving on the M.S. Rhein – a WWII German Freighter sunk near the Dry Tortugas in December of 1940. She sits in 240 FSW pretty much straight up and down with lots of damage from the shelling, fire, sinking and even a few hurricanes that have hit the wreck since its early demise in WWII. 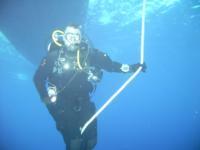 This is the first dive with my new VR3. With David’s assistance we program in the 3 gases I’ll be diving this morning. OK, so David punched them in and I watched as if I knew what the hell the computer geek was doing. I didn’t really care about my gas list. Once they were in I didn’t have to mess with those. I cared about one thing. “David, how do I change gases underwater on this computer?” On my old Nitek HE this was a simple task. Push button A and the gas number flashes. Push button B until the gas you want pops up. He says, “Push left button when the tank icon is dark and then push the right button to confirm the gas switch.” Well, it sounded simple. Maybe the reputation of overly complicated dive computer is undeserved. Maybe that 120 page instruction manual for the VR3 that I couldn’t manage to stay awake long enough to read wasn’t all that bad. Yeah, right. I haven’t "fixed" my buttons yet. The buttons do work. Richie said he thinks I just have some plastic burring inside the button holes. We rotated the buttons around a bit and that seemed to work. Eventually I’ll have to open up the button compartments and clean those things up. Just had too much diving to do to mess with it since it was actually working at the moment. I’ve been thinking about an upgrade to my unit. Actually, I would probably just get the latest go faster model at DEMA and either sell my VR3 or hold on to it as a back up / student model. Delta P has some very attractive offers for SDI/TDI Instructors.